Scott Lobdell's first full foray into Superman is imperfect, but there are enough achievements alongside the stumbles in Superman Vol. 3: Fury at World's End to make me optimistic that this book will get better as it goes. By no accounts is the character of Lobdell's Superman the same as the character of John Byrne's Superman, or Dan Jurgens's, or Jeph Loeb's (nor any of Superman's multimedia iterations), nor should it be; rather, love or hate the New 52, it's hard to argue that Lobdell's Superman isn't exactly the Superman that the New 52 calls for. Fury at World's End reveals two somewhat contrary elements inherent in Lobdell's depiction of Superman, which pushed and pulled at my reaction to this book. On one hand, Lobdell's Superman Clark Kent could be easily rejected as being "objectionably flip" in the vein of J. Michael Straczynski's Earth One Superman. This is a Superman who wishes he didn't have to have a day job, who melodramatically quits his job at the Daily Planet, who snoops on Lois Lane's text messages, and who at one point rather blithely puts Superboy in harm's way. In short, this is a terribly immature and fallible Superman of the kind I imagine many readers don't want to read about. At the same time, taken logically, this is exactly where the New 52 Superman might be at this point in his career -- a little rougher, a little less caring and careful than he might be later. Lobdell's Superman is "year one"-ish Superman (or do we say "zero year"-ish now? ), even despite that this depiction is generally inconsistent with his portrayal in Justice League, among other places. On the other hand, incongruously, Lobdell imbues this depiction of a young Superman at the start of his career with a healthy dose of aged Silver Age imagination. These pages are rife with references to Superman's off-screen adventures -- "the Talking Sun of Alktos Prime" and "the Stream of Eternal Maelstroms," among others, not to mention whatever went down last time between Superman and Lex Luthor. 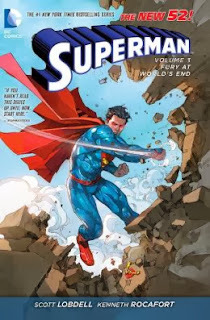 Even if this Superman is something of a jerk to stand and talk to, the culture that Lobdell builds up around his Superman offers shades of Grant Morrison's All-Star Superman -- a cosmic Superman who has sci-fi adventures beyond the limits of human understanding. Fury is largely made up of the Superman parts of the "H'el on Earth" crossover with the Superboy and Supergirl titles. H'el, surprisingly, emerges as a much stronger villain than the faux Bizarro he appears to be; H'el is instead something like Superman's evil older brother, like a Thomas Wayne for the Superman set. Moreover Lobdell reveals in the end that while H'el's origins might not be what he claims (or even knows himself), his past friendship with Jor-El could actually be genuine. In this, too, Lobdell offers hints that sticking around for the long-run will pay off. The book starts off with the Superman Zero Month issue in which Lobdell offers a wonderfully sci-fi Krypton, and the inexplicable presence of Superman there, combined with H'el time-traveling schemes, suggest a story to come that's even larger and more ambitious story than just this one piece. That Fury/"H'el on Earth" works, when at first glance it looked like it would not, is what makes me enthusiastic to read Lobdell's second outing on this title. I have not read "H'el on Earth" in full, but I did not have any problem following the crossover from just the "Superman parts." The part transitions don't tend to be based on crossovers, or at least Lobdell elides the breaks by moving the characters to new locations such that I never felt lost when I started a new chapter. If anything, understandably, the threat of H'el increases too quickly between the pages (given that we're reading every third part) and also the relationship between H'el and Supergirl progresses rather fast; I couldn't quite tell how the Superboy issues really factored into the story, but curious readers might want to pick up the Supergirl issues, at least. Lobdell's Red Hood and the Outlaws collaborator Kenneth Rocafort provides the art, and as opposed to the story, Rocafort needs no time to find his stride; his sharply angled, sketchy figures are perfect for the science-fiction elements of the story (Superman and Superboy's battle armor looks especially good). The conclusion of this book does offer what I believe to be the first use of "that Crisis pose" in the New 52, in which Superman cradles a seemingly-dead Supergirl in his arms; whether credit for this is Lobdell's or Rocafort's, I'm not sure, but I actually didn't like it. The benefit of the New 52, in my opinion, is to escape the storytelling cliches of the old DC Universe, i.e. creating drama in a scene not because of the scene itself, but by visually referencing a dramatic moment from a comic twenty years past. To begin to make these references again is, in my opinion, a slippery slope toward lazy storytelling. Taken on its own, Scott Lobdell's first full Superman issue, in which Clark Kent snoops and quits, might be worrisome -- I know it worried me. Taken as part of the whole of Superman Vol. 3: Fury at World's End, however, I see rougher parts of Lobdell's Superman smoothing out and plenty of good stuff already there. I wouldn't proclaim the second coming of the "Triangle Titles" era just yet, but after a rough debut in the New 52, I have more confidence now that Superman is on the right track. Next week: a review of Talon Vol. 1: Scourge of the Owls! This has "At World's End" in the title and it doesn't feature Superman with a Santa beard toting a gigantic conglomeration of gatling guns against twin clones of Hitler? ... wait, that was "Superman: At EARTH's End". My bad. I totally remember that cover. That is a sizable gun, isn't it? ... Possibly this means you have to review that book now. And the Kamadi book that came before it. Linkara already did both of those and he's far more thorough (and funny) than I'll ever be. I haven't read near enough of Lobdell's Superman, but it's high on my list of things comics to catch up on. Lobdell's Superman doesn't fit his Justice League depiction, Azzarello's Wonder Woman (thankfully!) hasn't got much in common with her Justice League counterpart etc. Which I have nothing against. Marvel's sort of the same way right now. Most of the books are in tune with Hickman's Avengers and the "Infinity" crossover, but the X-Men are stuck in some sort of parallel universe where people actually care about "Uncanny Avengers". Apparently Rogue's dead? Or something? Of all of DC's weird trade decisions, this one annoyed me the most. Except for the zero issue, everything in this trade is collected in the H'el On Earth collection. Despite reading trades only, skipped this one and just bought the zero issue. But wait: I regularly read Superman, Superboy, and Supergirl, so I was glad to be able to buy those trades and get the whole of "H'el on Earth" collectively in the trades I already read, without having to buy a separate crossover volume. If someone out there wasn't so interested in those titles, but they wanted to read the crossover, then they could buy the H'el on Earth collection. I don't think I understand what the problem is. This is a different situation than Throne of Atlantis, where crossover issues where duplicated between Justice League and Aquaman, so regular readers of those two titles must necessarily have bought two books with duplicate issues. But here, it seems pretty easy to avoid buying the parts you don't want, unless I'm missing something. I see what you're saying about just skipping the crossover volume if you read all three series. At the same time, if you're reading all three series wouldn't you want the story in one place instead of broken up into three different books? That's my preference, at least. But you're right, if a reader doesn't mind the story being broken up in three volumes, it's just easier to skip the crossover volume. I totally agree the Justice League/Aquaman collections weren't ideal. But at least if you only read one of those series, you were able to get the full story, which isn't the case here. I guess I can't imagine someone would only want their series' half of a story, or in the case of H'el on Earth, one or two thirds of the story even if each part reads well enough on its own. If you're a fan of a series, I'd think you'd want the full story featuring that character, even if the story is crossing over to other books. That's where I'm coming from. If you only read Superboy or Supergirl, you won't get the end of the story unless you also buy the H'el on Earth collection. The individual collections aren't self-contained. I think this approach works much better when it's a broader crossover, like Death of the Family. There, if you're collecting all the Batman books, you'd have no need to get the Joker collection. But if you were only reading the main Batman series and wanted to see everywhere else Joker turned up, then the Joker collection is better than buying 6 or so other trades. Ideally, I wish DC would stop both splitting crossovers and duplicating issues in multiple trades. The next issues will be even trickier to collect. If Amazon is to be believed, the next volume will include Superman #18-24 and Annual #2, which would mean the Psi War three-parter would be missing its second chapter (Action Comics #24). And then there's the Return of Krypton crossover, which starts in Action Comics Annual #2 and continues in the #25 issues of Superboy, Supergil and Superman, all plotted by Lobdell. Hopefully readers won't have to buy four separate collections to get the whole story. And as it turned out, Psi-War had all of its issues (including Action Comics #24), but Krypton Returns could only be read in full in its own collection.